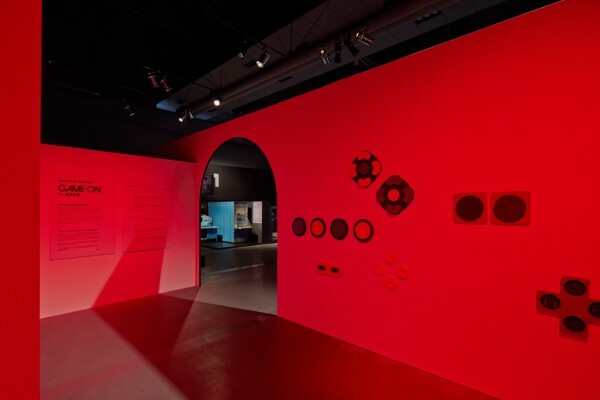 WORKS / GAME ON: Why are videogames so interesting? 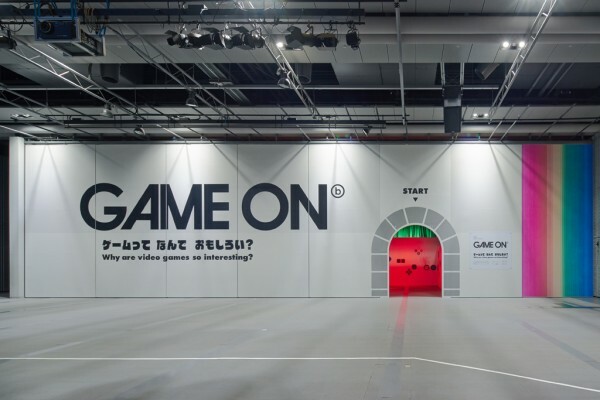 We conceived the installations for the "GAME ON: Why are video games so interesting?" 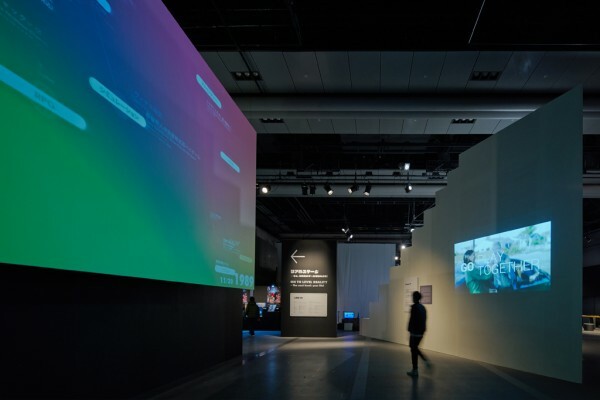 special exhibition held at Miraikan, the National Museum of Emerging Science and Innovation. 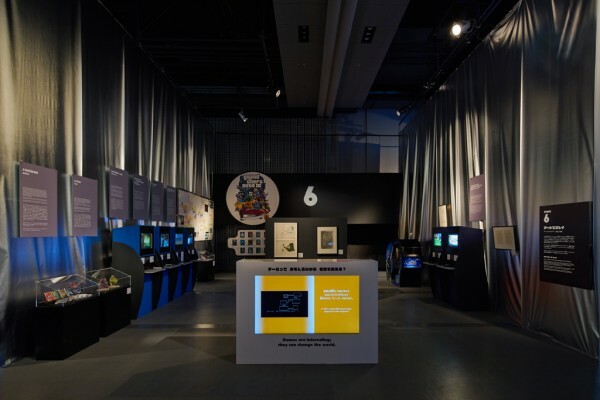 This world-touring exhibition by the Barbican Centre, UK, featuring an overview of the evolution of video games, is presented in Japan for the first time. 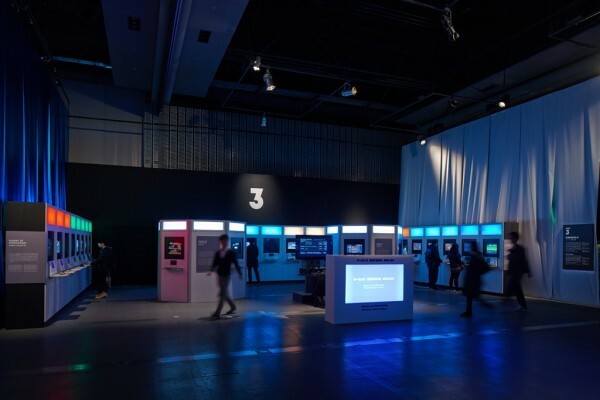 Moreover, it offers a fresh look into what makes video games so interesting, and invites us to think about the social and cultural meaning of computer games while indulging in some serious fun in a hands-on gaming area. 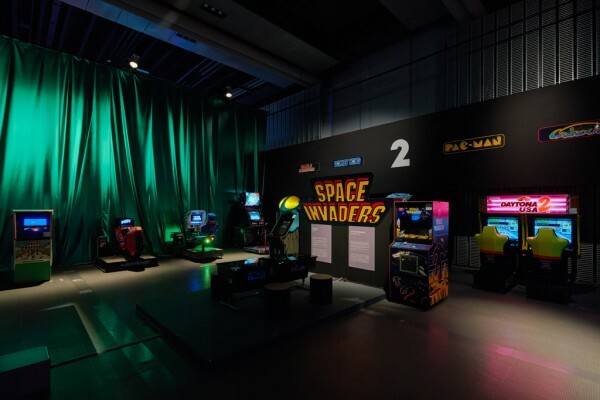 Deliverables included a space allowing for a free line of movement, where visitors can experience each step of the evolution of games by playing various game titles from the early days to the present, which are grouped into eight stages, starting from arcade gaming titles—including “Space Invaders”—to home video game consoles, as well as a peek into the future of gaming. 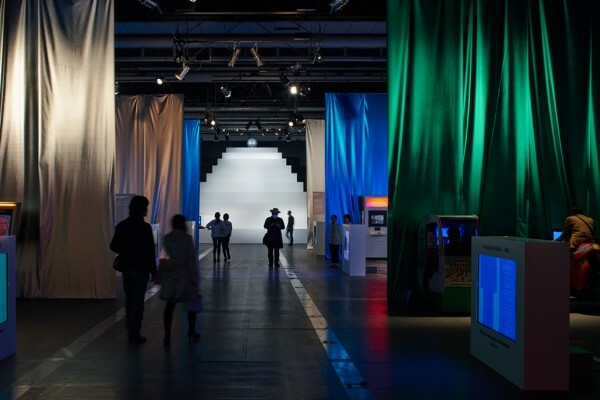 The arched entrance gate opens into an expansive exhibition site where eight stages divided by six-meter-high curtains can be found on each side of a main path. 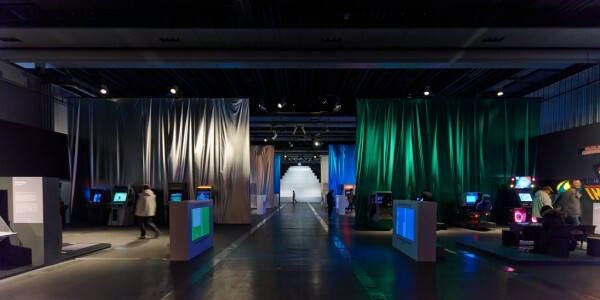 The custom-made curtains feature four metallic colors laminated in aluminum which reflects the brilliant lights from the game screens, while the draping applied also highlights the shadows. 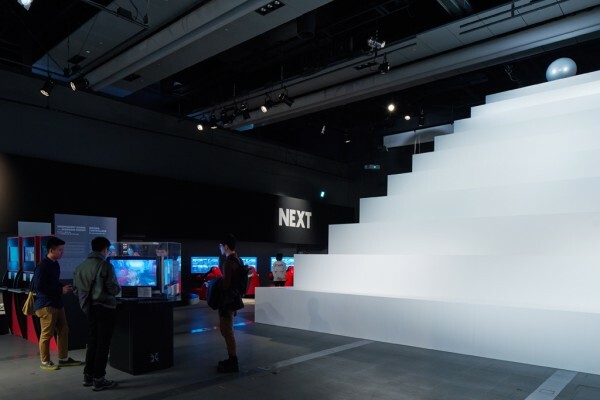 The end of the path is inhabited by an imposing stepped symbolic object emitting a white light, against which visitors stand out as silhouettes. 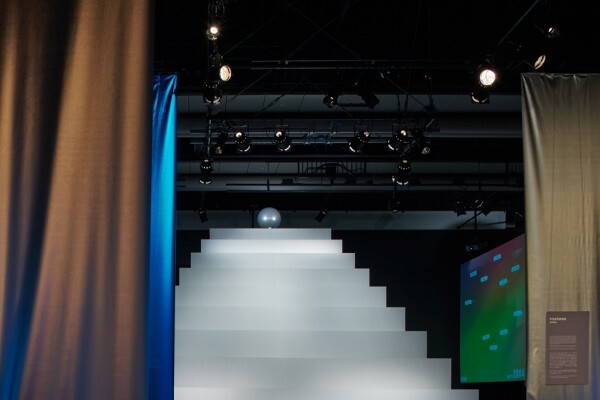 Furthermore, the oversized multi-layered curtains and the stepped object—reminiscent of a temple in an adventure game—offer an immersive experience designed to spark in visitors that sense of exhilaration brought on by clearing a stage in a game. 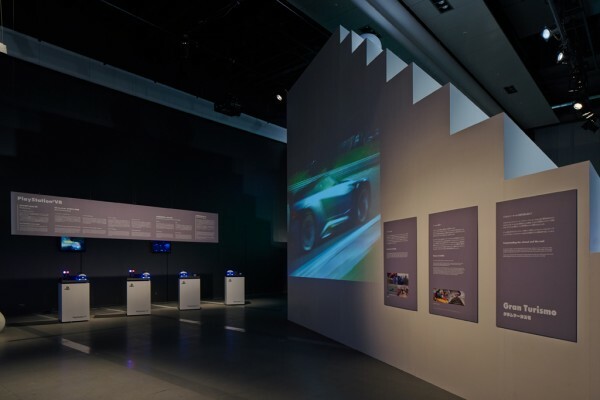 We sought to create an exhibition space characterized by a strong symbolism which serves as a background for a variety of exhibits filled with colors, such as that from game equipment monitors.